U.S. Chamber Targets "Lawsuit Abuse"
The U.S. Chamber Institute for Legal Reform (ILR) is the most effective and comprehensive campaign committed to improving the lawsuit climate in America and around the globe. ILR’s mission is to restore balance, ensure justice, and maintain integrity within the civil legal system. We do this by creating broad awareness of the impact of litigation on society and by championing common sense legal reforms at the state, federal, and global levels. ILR’s approach is highly aggressive and pragmatic, focused on achieving real change in real time while laying the groundwork for long-term legal reform. ILR’s hallmarks are the execution of cutting-edge strategies and a track record of visible success. ILR has just released its list of the Top Ten Most Ridiculous Lawsuits of 2013, with a lighthearted YouTube video mocking them. Of course, the plaintiffs and their attorneys in those suits don't necessarily agree with the Chamber's assessment; a few are quoted in this National Law Journal story. For a different perspective on civil litigation, see the American Association for Justice's Fighting for Justice pages. In the 10th year of Dennis Kennedy's Blawggie Awards, Law Librarian Blogs got the award in the Best Law-Related Blog Category. I use this category annually to highlight the blogs written by law librarians, a category that I don’t think gets enough attention. These blogs are places to find great information, help for finding information, links to great resources and just plain interesting insights into topics like knowledge management and our changing world of information. If you want to try just one, Sabrina Pacifici’s BeSpacific Blog provides a steady stream of links to great US government and other information. The Law Librarian Blog is a great starting place and there’s a great list of law library blogs here. On behalf of all of the law librarian bloggers out there, thanks for the shout-out Dennis! Legal Scholarship Blog, a collaboration between the Ohio State, University of Pittsburgh, and the University of Washington law libraries. A great source for learning about calls for papers, conferences, and symposia. Gallagher reference librarian Mary Whisner is a major contributor to this blog. Seattle University Law Library blog features information about new books, databases, legal research guides, and Today in Legal History information. Trial Advocacy Notes. Mary Whisner created this blog to support the Trial Advocacy Program at UW Law. For more links see the list of Law Library Blogs maintained by the Computing Services Special Interest Section of the American Association of Law Libraries. Are you on the road during the break? Visiting family, catching some sun in Hawaii, skiing in Utah? Whether or not you actually go to another state, Stateline (from the Pew Charitable Trusts) can help you get an idea about what's going on. In How Does Your State Stack Up? the editors give links to "some of our most popular interactive features from 2013. From the impact of food stamp cuts to the shrinking number of school districts nationwide, these features resonated with readers and helped us illuminate state politics and policy in a creative way." The scanning/printing system in the library will be down this Sunday between 9am and 2pm. If you have any specific questions please contact uwcshelp@uw.edu. Time Magazine created a series of videos on the Bill of Rights. Below is the video on the First Amendment. If you enjoy it, you can explore the other nine. There's also a fun cartoon about the Bill of Rights. The original draft of the Constitution didn’t include a formal commitment to individual rights. In fact, George Mason’s last minute motion to include a Bill of Rights in the Constitution was unanimously defeated. Some years earlier Mason, a delegate to the Constitutional Convention, served as part of a Commission charged with developing a bill of rights for the Virginia Constitution. He considered this omission in the US Constitution so egregious that he refused to sign. Yet, following this letter, James Madison introduced seventeen possible amendments, which formed the basis of our current Bill of Rights. Groups celebrating Bill of Rights Day include an ACLU chapter and a coalition of gun-rights groups. Yet, despite some efforts to celebrate and educate, it was noted that Bill of Rights Day is not regarded with the same degree of importance as other holidays that garner national attention, such as Independence Day. Patrick M Garry, Limited Government and the Bill of Rights (2012) [Classified Stacks KF4749.G37 2012]. Jeff Broadwater, James Madison a Son of Virginia and a Founder of the Nation (2012). Eric T. Kasper, To Secure the Liberty of the People: James Madison’s Bill of Rights and the Supreme Court’s Interpretation (2010) [Classified Stacks KF4749.K36 2010]. Have a happy Bill of Rights Day! Do finals have you stressed? If finals have you stressing, be sure to take a break. Get some fresh air, eat some Doritos and catch up on celebrity gossip. If you're still feeling overwhelmed, take a minute (or 3 minutes and 14 seconds) to laugh at this cute YouTube compilation video of dogs too scared to walk past cats: The video is aptly titled, "You Shall Not Pass, Dog." While not all the dogs pass their cats, we have every confidence that you WILL pass your exams! Good luck! Perhaps you want to hold onto that law classic for some holiday reading? Or perhaps you can’t make it to school one last time after your final exam. Don’t worry! Extending a loan period for library books is simple. Borrowed materials from the Classified Stacks and the Compact Stacks may be renewed if there are no holds and if the materials are less than 2 weeks overdue. To renew, use the "My Library Account" link found on the Library homepage, beneath the catalog search box and login with your UW NetID. After you login, select the books you want to renew from the “Your Library Account” tab and then click “renew selected.” An updated due date will then appear next to the selected books. Questions? Please visit the Circulation Desk (or call 206-543-4086) to inquire about Circulation Services. A new website is changing the way we can research and visualize court cases throughout history. Still in its Beta form, Ravel Law is a newly released website developed by two Stanford Law School students that not only allows you to search for cases, but lets you see just how these cases are connected and ranked by influence. The Ravel Law homepage resembles Google with its clean and easy-to-navigate interface. The database allows you to search for Supreme Court and Court of Appeals cases in much the same way as you would use Google with Boolean searches and the option of filtering by jurisdiction. However, the fascinating part of Ravel Law is in the presentation of its search results. Those who are more visual will be especially interested in the graphical analysis of the search results. Seventy-five of the most relevant cases from your search list are represented by a circle along an x-axis representing the year. The larger the circle, the more important the case is based on citations. Hovering over the circle will show you the case as well as which other cases have cited to it. A line is drawn between the circles, creating a visual web of inter-related cases. Your search results may still be viewed in list form on the right side of the page. Ravel Law gives you free access to all Supreme Court cases and Court of Appeals cases to 1925. To get the more benefits of the site, sign up for a free account! An added benefit with an account is that you can highlight and annotate cases yourself. A premium account is available which, in addition to the basic sources, gives you access to District Court cases and all state cases to 1950 (except the Dakotas), the CaseNA Page Guide, and Judges’ Threads Analytics which provides statistics on the justices’ opinions. There is much to explore with this site, so check it out! The ABA Journal currently has its polls open to vote for your favorite legal blog. 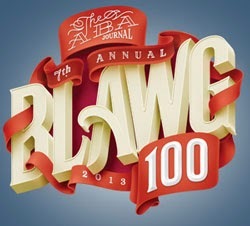 With the thousands of legal blogs out there in the blogosphere, it seems to be an honor just to make the top 100 list. Nominees use their intellect, creativity, and wit to further advance the legal profession. Not only are some of these blogs fun, but many also provide thorough and educated explanations of current legal events. Check out this list and vote for your favorites here. Polls opened Nov. 25 and will close Dec. 20. There are already a few front runners in each of the 13 categories, which range from criminal justice to legal technology. · What the Public Defender? Check out the list of all 100 nominees and vote! At the very least, you may add some new bookmarks to your browser.